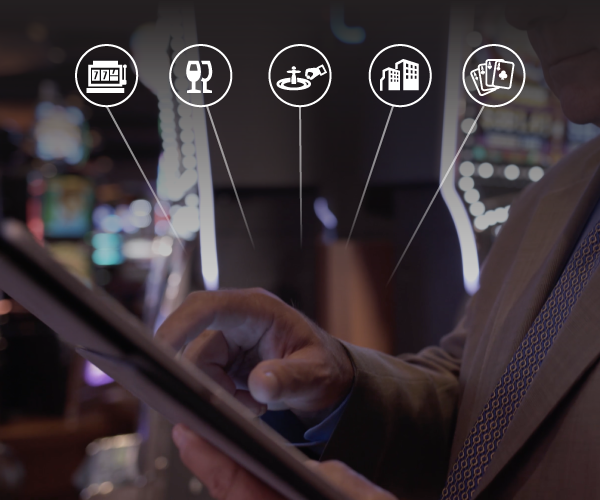 VizExplorer helps smart casinos achieve operational intelligence, with solutions that let operators analyze live, fast-changing data and take action to optimize and drive profitability in the spaces they operate. With fierce competition for the entertainment dollar and a shifting customer demographic, casinos today face constant pressure to maintain and grow profitability. Navigating these challenges requires operators to be smarter and more efficient while identifying ways to enhance the experience for their players and guests. While payout, volatility, games played per hour, incrememental visits and other metrics remain critical markers of profitability, the data needed to manage the business is scattered across separate systems and is usually inaccessible to the decision makers driving day-to-day operations. The smart casino works by consolidating data from across various systems into a single usable view, which gets real-time insights into the hands of casino operators when and where they need it most. This is operational intelligence that informs good decision-making, helps departments work together more effectively, and lets management take action to drive profits. Sophisticated casino operators have long realized the value of good, real-time data, but few have found the perfect combination of solutions to make data gathering, analysis and subsequent decision-making easy. Until now. "VizExplorer's Operational Intelligence solutions will help us optimize key areas of our operations, including the gaming floor, marketing campaigns, and hotel occupancy. We are excited that VizExplorer will enable us to leverage our existing data and provide views of our customers across the entire property." "We’ve chosen to implement a wide range of the VizExplorer products to support all aspects of our operations; from marketing and loyalty campaigns to player development and gaming floor optimization." VizExplorer powers the smart casino with a range of products that comprise our Gaming OI solution. 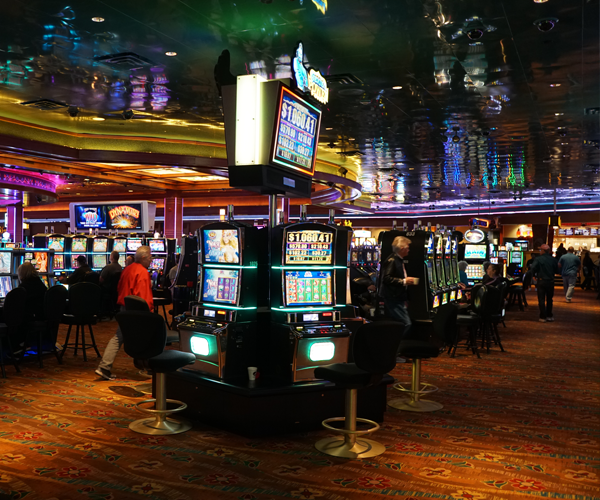 Our solutions span slot floor optimization, player development, marketing campaign management, dispatch and service management, and even customer service automation--requirements for casino operators looking to use good data to make better business decisions. floorViz™ maximizes slot floor profitability by optimizing game change decisions and delivering slot placement and performance analysis. campaignViz™ improves the performance of your marketing campaigns and drives incremental visits through smart customer segmentation, test and control analysis and much more. tableViz™ with ChipVue™ powered by ARB LABS takes the pain out of rating table game players, giving operators a complete view into the performance of their dealers and games. hostViz™ gives your hosts the intelligence and reporting they need to develop players, track performance and grow their customer bases. techViz™ helps boost slot attendant and technician performance with real-time dispatching, alerts and mobile task management. greetViz™ is a lightweight tool that automatically issues mobile alerts to team members upon predetermined guest events, ensuring real-time responsiveness and a high level of customer satisfaction. VizExplorer® CashInsite™ with Everi IQ™ provides casino marketers with unique insights related to their player loyalty and transaction behavior at their property. 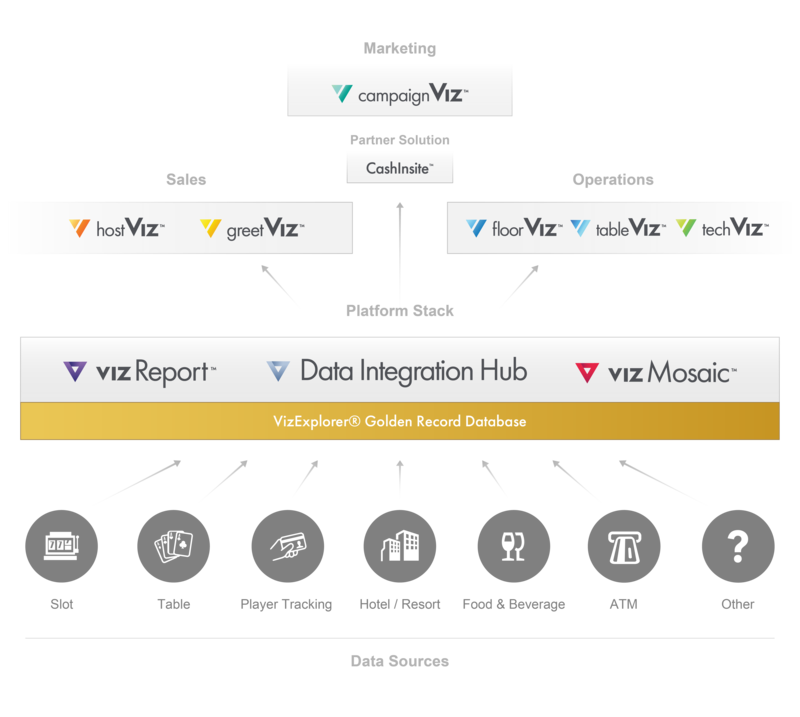 VizExplorer's Platform Stack provides all the tools to intelligently integrate all casino data, from slot performance and player information, to food and beverage data. Turn your property into a smart casino. Learn how to leverage VizExplorer solutions today.